He was lovingly known as “Uncle Carl” and the “Little Napoleon” to those who knew and worked for him. 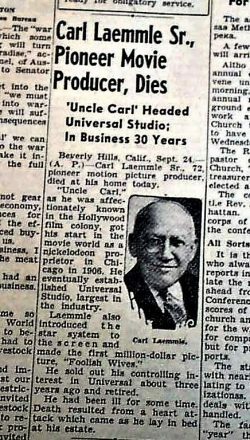 Carl Laemmle, Sr., motion picture pioneer and founder of Universal Studios, was the first of the movie moguls to pass away since the death of Irving Thalberg just two years earlier. A German immigrant, Laemmle had only $50 when he first arrived in the United States in 1893. In his early years, he first was a package-wrapper in Chicago, and then a clothing store clerk in Oshkosh, Wisconsin where he eventually became manager and saved $2,000. In 1906 he returned to Chicago and opened a 5 and 10-cent store where he happened to behold a line of people waiting to pay their nickels to see a motion picture and decided to become a film theater operator instead. He named the theater the White Front and charged 5 cents, offering whatever crude films he could find. From this he established a film exchange and from that success, went to New York where he began to produce his own films. This ultimately led to the founding of Universal Studios and film history when he sent a company to England to film Ivanhoe (1913) in its original setting. Moving operations to California, he eventually purchased 230 acres in the San Fernando Valley, just outside of Hollywood, and here founded Universal City on March 15, 1915. His most successful films included Traffic in Souls (1913), Foolish Wives (1922), The Hunchback of Notre Dame (1923), Phantom of the Opera (1925) and All Quiet on the Western Front (1930) which won the Academy Award for Best Picture that year. When talkies arrived, he remained president but handed much of the studios production to his son, Carl Laemmle, Jr. In 1936, because of financial problems, most notably due to the overruns on the budget of Showboat (1936) and the ravages of the depression, Laemmle was eventually forced to retire, selling the studio to Standard Capital Company. For the next three years, Laemmle maintained an office in Hollywood to take care of his various business interests. He finally ceased this activity, and spent most of his time at his home at 1275 Benedict Canyon, which was the former residence of producer Thomas H. Ince. Laemmle suffered his first heart attack on July 14, 1939; this was followed by several milder attacks. On September 23, he went for a car ride hoping to gain some relief from the heat. Upon returning he declared that he felt a “little wobbly” but slept soundly the rest of the night. Early the next morning he suffered two more heart attacks and his doctor was called. The third and fatal heart attack occurred while he was still in bed. Present at the time of his death was his son, Carl, Jr., his daughter, Rosabelle Bergerman and two physicians. Laemmle was also survived by two brothers, Siegfried and Louis Laemmle and two grandchildren, Carol Bergerman, 9 and Stanley Bergerman, Jr., 7. “The passing of Carl Laemmle was a shock and a great loss to the motion picture industry. “Carl Laemmle was more than a pioneer, he was a builder. A kind, gentle man, he fought for the industry at a time when it was weak and shackled, and due to his courage and independence, the fight that was of nation-wide importance in its time was won. 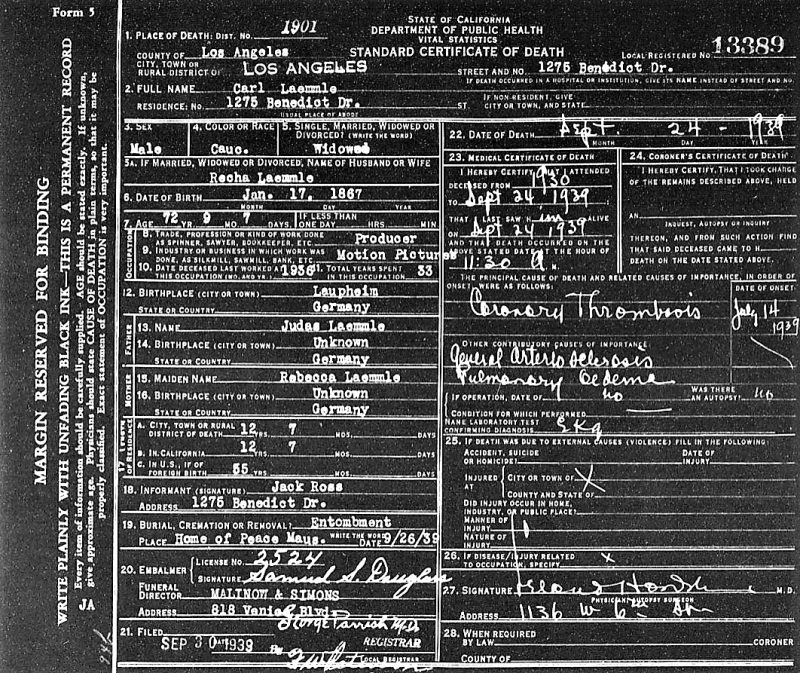 That day, Laemmle’s will was taken from a bank vault and scanned to learn whether he had expressed any last wishes as to his burial — which he had not. 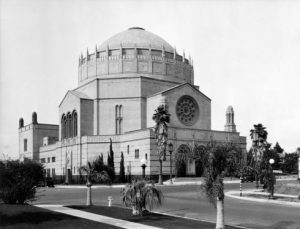 At the time, his family was undecided as to whether he would be buried beside his wife (who died in 1919) in a mausoleum in Salem Field Cemetery in New York, but finally determined that he would be laid to rest at Home of Peace Cemetery in East Los Angeles. 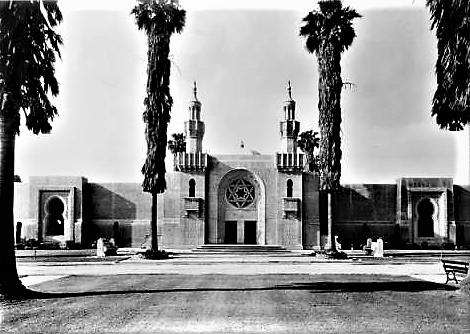 It was also announced that Rabbi F. Edgar Magnin, the “Rabbi to the Stars,” would give the eulogy and read the ritual over Laemmle’s body, which would lie in state at the Wilshire B’nai B’rith Temple (Wilshire Boulevard Temple) from 11:30 AM the next day up until the time of the services. As a mark of respect, at 12:30 PM on September 26, there was a five-minute period of silence at all of the studios in Hollywood, at the home offices of Universal in New York and at all of the Universal film exchanges throughout the world. Rabbi Magnin intoned prayers over Laemmle’s body as nearly 2,000 of his friends and former associates listened at the Wilshire B’nai B’rith Temple. The ceremony was simple, as requested by the family. Laemmle lay in a copper coffin at one side of the pulpit, banked high with flowers. Touching briefly on Laemmle’s rise to success from a poor immigrant from Germany to a leader in the film industry, Rabbi Magnin pointed out it was not the money he made nor the power he wielded but what he did with his wealth and his power. “Many people are mourned after their death but not loved while they are alive, particularly those who have power which makes them so susceptible to hatred. “But here was a man who was loved by all. He was kind and sweet. He saw all who needed him and never with a display of arrogance. He was always the same, sweet and simple. He never forgot he was a poor boy. “He gave generously of his purse and his heart. His charities were widespread and of this I, personally, am acquainted. He gave to the organized charities but he helped more people in an individual way. He established a foundation and he took a personal part in it. “He always gave to people who needed help, but he made them feel that they were earning what he gave them. “He was a fine American. He was born in Germany and he always had a tender spot for the German people. He full well realized in the World War as today that they are victims of a government. During the service, Laemmle’s daughter, Rosabelle, almost broke under the strain. It was only a few minutes after Magnin’s closing words that she was able to leave the temple and go with relatives to the cemetery for the interment. 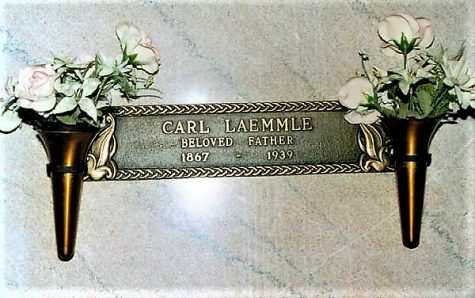 Carl Laemmle was laid to rest in a private family room of the Chapel Mausoleum at Home of Peace Cemetery. Universal Studios is still a major film company; one of only a few that still exist at their original Hollywood location. 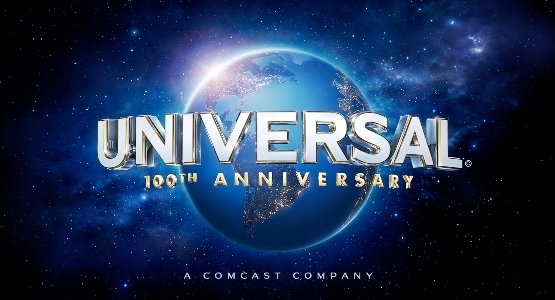 The 100th anniversary of Universal Studios was celebrated this year (April 30) thus making it the first of the major Hollywood studios to achieve that impressive longevity. The story of Universal, especially the years of Carl Laemmle’s control, is typical of the industry and carries a recognizable theme that reverberates through all American business successes. When Carl Laemmle arrived in New York at 17 years-old, he had $50 and a telescope valise packed with only a few personal items from his home in Laupheim, Germany. From there he headed west like many other immigrants and found odd jobs in stores, factories, working as a farm hand in South Dakota, as a bookkeeper in Chicago and as the general manager of a department store in Oshkosh, Wisconsin. Twenty-two years later, Laemmle had saved a capital of $2,500 and started on his next venture. Laemmle had returned to Chicago where he waited in line for the new sensation, the motion picture shows, which was shown in a store converted to resemble the interior of a railroad coach; the motion picture representing scenery was viewed from the rear of a train. Laemmle was astonished at the long line of people willing to pay a dime for this privilege and envisioned the possibility for a new money-making opportunity. With the assistance of R. H. Cochrane, a young Chicago advertising man, they acquired a store on Milwaukee Avenue where he opened the White Front Theater on February 24, 1906 (it had been the White Front store and the sign served as a name for the theater). It was on a Saturday night and he gave patrons fifteen minutes of movies and a song with beautifully colored slides. On Sunday he ran twenty shows. At five cents a head his gross for the two days was $192.05. That was the beginning of a long association with Cochrane who later became a vice-president of Universal. A second theater was soon opened and from that point Laemmle entered all branches of the rapidly expanding motion picture industry. This new success brought him into conflict with the larger interests in the industry. After breaking with the Patents Company, which owned most of the patents on cameras, projectors, etc. he announced he would produce his own films. The Independent Moving Picture (IMP) Company was formed. Its first film, Hiawatha, was released in October 1909. IMP has been given the credit for introducing the star system to Hollywood, when it signed the Biograph Girl, Florence Lawrence, and billed her name above the title of her pictures in 1910. Over the next three years Laemmle battled Edison’s motion picture trust which was followed by a federal investigation, leading to the termination of the General Film Company. 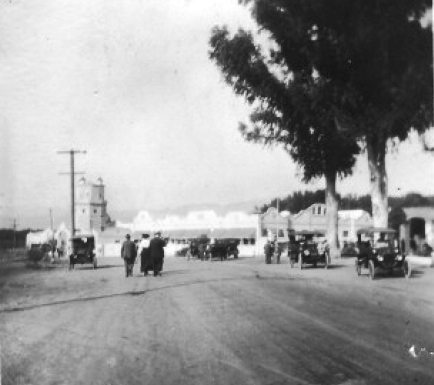 Following other film producers, by the end of 1912, Universal was making most of its films in Hollywood on the northwest corner of Sunset and Gower. During the first year of the studio’s operation, 250 films were produced, mostly two-reelers. As Laemmle and Universal prospered, he purchased a former chicken farm, the 230-acre Taylor ranch on the banks of the Los Angeles River five miles north of Hollywood. The land was part of the ancient Rancho Cahuenga de Ramirez and on the property where General John C. Fremont and Pio Pico signed the Treaty of Cahuenga. Formal dedication of the studio on March 14, 1915, was an affair heralded by posters in railway stations throughout the country. Exhibitors were brought here by special trains to witness the ceremony. Laura Oakley, Universal City’s female police chief, presented Laemmle with a golden key and he officially unlocked the huge front gate of the studio as bands played. Flags were unfurled and a cheering crowd of 20,000 jammed Lankershim Blvd. Universal City came into existence and the studio was created as a small city with a population of nearly 300, with its own post office, fire department and police department. Children have been born on the lot and men and women have died there. 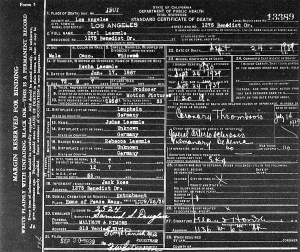 Virginia Richdale Kerrigan, the daughter of William W. Kerrigan, one-time manager of Universal and the twin brother of actor J. Warren Kerrigan, had the distinction of being the first baby born on the Universal lot in 1915. Tragically only nine years later, Virginia’s dress caught fire at a Christmas gathering and she died from her burns. Many of the 300 Universal employees lived in houses on the lot when the studio was opened in 1915. Some merely converted sets into practical living quarters and others just camped. 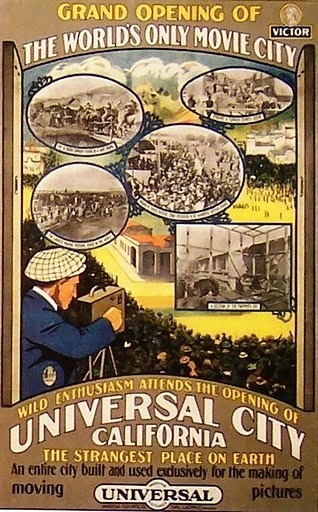 Most of the actors had horses, for Universal was the home of the Western, which provided the studios bread-and-butter in the first two decades. The players with horses carried saddle bags in which were stuffed two uniforms. Sometimes they would appear in the mornings as Indians and after lunch, once the Indians were defeated by the cowboys, they would switch costumes and chase the images of themselves. One day in 1916, Harry Carey, one of Universal’s early western star attractions, was leading a bunch of cowhands down Broadway when the whole group tired of the script. Just for fun, and the undying mortification of the city’s budding social set, Carey and his dusty mounted troupe, rode up the steps and into the lobby of the stylish Alexandria Hotel. 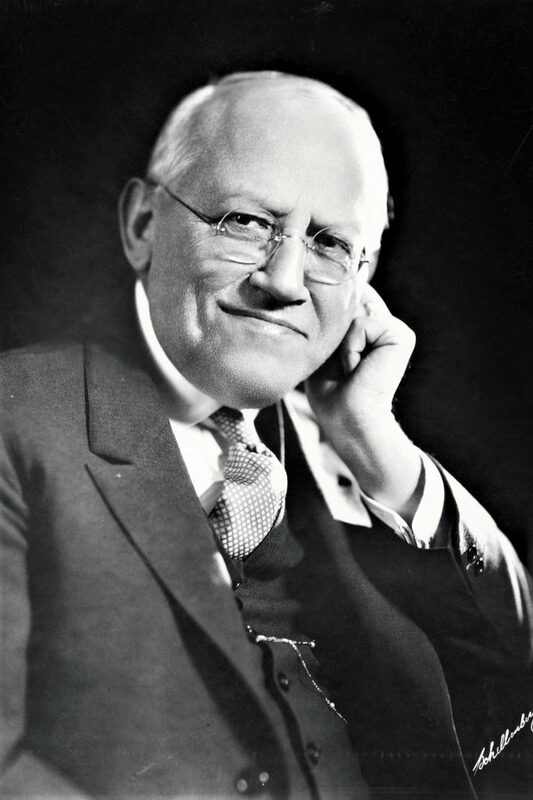 Laemmle’s greatest pride was for his son, Carl Laemmle, Jr., who was originally named Julius after his grandfather in Germany. But when the senior Laemmle made him general manager of Universal on his twenty-first birthday, Julius became Junior. Something else that Laemmle loved was gambling. High-stakes poker games with such cronies as Joseph Schenck and Sid Grauman would last all night and when the local action slowed a bit, Laemmle thought nothing of taking quick trips to Agua Caliente, the Mexican forerunner of Las Vegas. One night he lost $10,000 there. In one weekend, he lost three times that. Many famous names in Hollywood history served at one time or another on the Universal lot. On it Charlie Chaplin courted Mildred Harris and Wallace Reid won Dorothy Davenport. John Ford and William Wyler (a Laemmle family member) received their early training at the studio—on Harry Carey westerns and farces with Laura La Plante. Such films as Phantom of the Opera (1925) and Hunchback of Notre Dame (1923), both with Lon Chaney; Showboat (1929 and 1936) and the Academy Award winner, All Quiet on the Western Front (1930) were made there. The studio launched the comedies of the 1930s with My Man Godfrey (1936) and introduced Deanna Durbin as a 14-year-old singer in her first great success, Three Smart Girls (1936). The studio also produced such classic soap operas as Magnificent Obsession (1936), Back Street (1932) and Imitation of Life (1934), the same titles that turned out to be box-office hits in the 1950s in remakes refurbished with color. 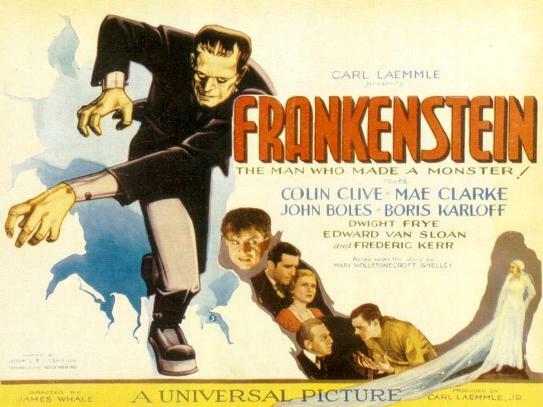 And of course, there are the famed monster films which include Frankenstein (1931), Dracula (1931), The Mummy (1932) and The Invisible Man (1933). All studios were famous for their publicity stunts, but one at Universal had repercussions for many years to come. For the film, The Black Cat (1934), an adaptation of an Edgar Allan Poe story, the studio advertised a county-wide contest for a cat to play the title role. Every child in town showed up. By the time the pre-selected winner was announced, cats were loose everywhere. Few chose to return home, and for decades (and possibly to this day) the studio lot teemed with their descendants. 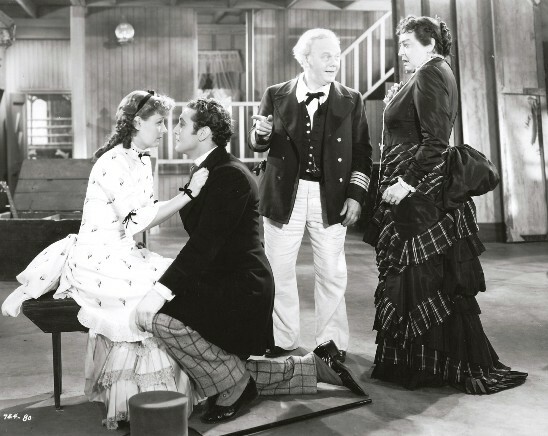 The Laemmle era came to an end in 1936 when the studio produced a lavish remake of Show Boat, featuring several stars from the Broadway stage version. Carl Jr.’s disturbing spending habits, the studios attempts at high-quality productions and the costs of modernizing and upgrading during the depression brought about their decline and being placed into receivership. Stockholders demanded that the Laemmle’s take out a loan from Standard Capital Corporation to make Show Boat, using the family’s controlling interest as collateral. When production problems created a huge overrun, the loan was called in and Universal could not pay. Standard foreclosed and seized control of Universal. Ironically when Show Boat was released it was a financial success but it was not enough to save the Laemmles who were forced to leave the studio on April 2, 1936. 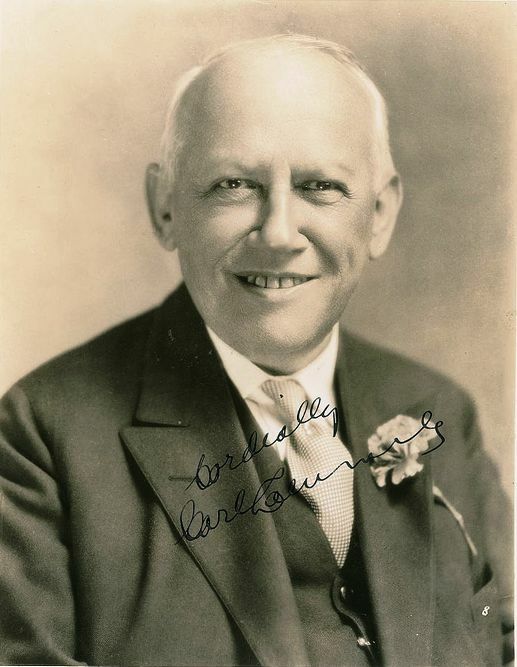 Carl Laemmle died three years later at the age of 72. Despite low periods in its history, Universal Studios has survived. Over the past seventy-plus years Universal has had several owners and name variations. It is the debris from the Laemmle years, 1912 to 1936, that saw hundreds of films made on the 230 (and eventually 410) acres and that form most of Universal today. It doesn’t look much like a chicken farm any more. Hollywood wasn’t always an open air asylum. It was founding in 1887 by retired bluenoses as a prohibition town. No drinks, no excitement. A horse could not turn a corner at a speed greater than six miles per hour. It was a nice place if you were an orange. Movies were unheard of in Hollywood, even in 1900. The flickering shadows were devised in a place called Fort Lee, N.J. It had forests, rocks, cliffs for cliff-hanging, and the Hudson River. The movie industry had two problems. The weather was unpredictable, and Thomas Edison sued producers who used his invention. A romantic two-reeler could be made in three days for $1,000 if the rain stopped and if the process servers got lost on the Dyckman St. ferry. The Selig Polyscope Co. heard from a director, Francis Boggs, that a tiny town called Hollywood, Calif., had everything. There was perpetual sunshine, palm trees, the Santa Monica Mountains for westerns, a beach for provocative mermaids, and an ocean for sea stories. William Selig, the owner, went to see Edison. They organized the Motion Picture Patent Co. Selig was ready to go west. All he had to move were a couple of hand-cranked cameras, a director, a leading man and a leading lady, and a dozen unemployed actors. In March 1909, Selig arrived in Los Angeles. He didn’t have to bring scenery. It was all in place. His two-reelers created envy in the East. In the autumn, Biograph and D.W. Griffith moved to Los Angeles. By spring, Pathé, Vitagraph, Lubin and Kalem had gone west. Strangely, they not select the small town of Hollywood. The studios were in Glendale, Pasadena, Santa Barbara, San Diego and Santa Monica. It was not until 1911 that David Horsley moved his Nestor Co. west. 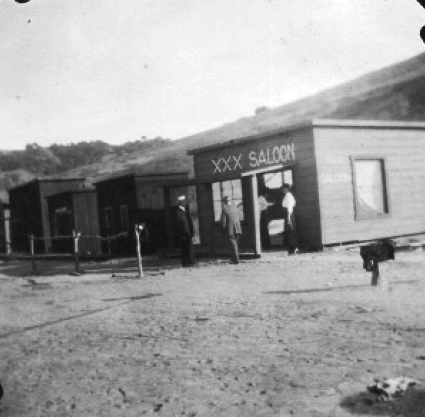 The prohibition town, Hollywood, had an abandoned saloon at the corner of Sunset Boulevard and Gower Street. The prohibitionists learned too late that, while it was desirable to have no booze, Hollywood also had no water. The little town was forced to incorporate itself with Los Angeles. Local ordinances became invalid. At the same time, the suburban towns yanked the welcome mat from the movie people. William Fox moved to Hollywood. Carl Laemmle bought the Nestor studio. Essanay and Vitagraph made it unanimous. 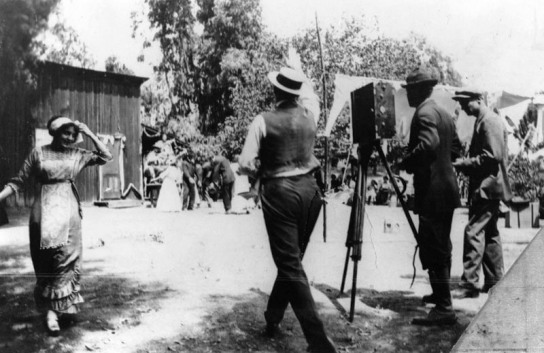 Mack Sennett shot his comedies at the beach or in the middle of the street. His actors pushed their way into public parades and skidded automobiles over dusty roads to create excitement. Millions of people were paying a nickel a head to see these epics. Charlie Chaplin arrived. So did Harold Lloyd. A teen-ager named Mary Pickford was seen in a nightie, yawning and holding an automobile tire with a credo: Time to Retire. The brought her out. And Mabel Normand, Tom Mix and William Farnum could actually ride a horse. So could William S. Hart. Movie plots became longer, more intricate. High-ceilinged studios were built. The prohibitionists left Hollywood in dismay. To them, it became a place of sin. Cecil B. DeMille heard that Griffith had spent $100,000 on The Birth of a Nation, featuring the Gish sisters. He decided to spend more on sophisticated movies like Why Change Your Wife? and Forbidden Fruit. The movie-goers admired certain actors. This led to the star system. In 1909, a star was paid $5 a day. Five years later, Mary Pickford was earning $1,000 a week. 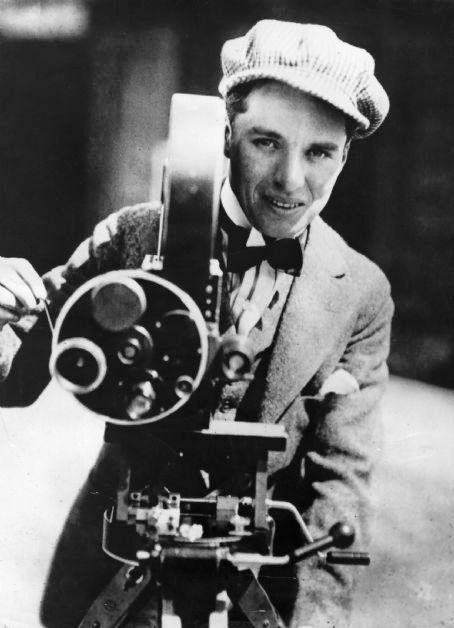 An English comic, Charlie Chaplin was paid $150 a week in 1913 by Mack Sennett. Two years later, he was getting $10,000 a week. What had started as nickel theater became a gigantic industry. Some studios built their own theaters across the nation. Movies seduced the emotions of America two hours at a time—laughter and tears. Where there is big money there are fights, consolidations and codes. The independent producer was squeezed out or bought out. Movie magazines, which pretend to purvey the private lives of the stars, flourished. Pretty girls in Iowa and Maine were told “you ought to be in pictures.” They went out west and, with few exceptions, became hash slingers or worse. Hollywood became the magic Mecca of make-believe. It was, in those days, a sparkling city of fame and light. Today (1979) it is smog and freeways, freaks and drugs, cults and sexual religions, front money and mortgages, stupendous hits and duds, economic knifings and gossip columnists, movie agents and press agents. Baby, you’ve come a long, long way. As of today, Universal Studios has spent 96 years at its present location in the San Fernando Valley. In mid-1912, Carl Laemmle, a pioneer independent producer, made his early Universal pictures at a small studio on Sunset and Gower in Hollywood. In 1915, upon the advice of Isadore Bernstein, then his studio manager, a former chicken farm in the valley was purchased. Immediately, a farming community began its transformation into a choice residential section and the motion-picture studio, previously more of a factory, became a veritable world unto itself. Universal City was incorporated as a city with its own post office and governmental recognition. Laemmle began the festivities and opened the big white gate with a golden key at 10 a.m., and he and Bernstein, headed the procession of 100 guests. Once inside the gate, gaily-clad Universal girls pelted the party with flowers, and a big caravan of mounted cowboys and Indians saluted with pistol shots and bands played, and Pat Powers, treasurer of Universal, hoisted a huge American flag, followed by a display of daylight fireworks. Thomas A. Edison and Henry Ford drove down from the San Francisco’s World Fair to dedicate the immense 500-foot open stage at the new studio, arriving late because their car broke down. Notable among scenes presided over by different directors were a beautiful interior designed by Charles Giblyn, where Cleo Madison entertained the crowds, and a set showing the interior of a hunting lodge in Africa, where Henry McRae calmly stroked two live leopards. Other sets included a bit of Moorish architecture and a snow scene. MacRae then filmed a spectacular scene for The Torrent (1915), a two-reeler with Marie Walcamp, and thousands stood spellbound as a large reservoir in the hills behind the studio unloosed a flood of water which washed away a street of cottages built down the middle of the valley for the big climax scene of the production. Another thriller which had a tragic ending was the repetition of an airplane bombing which was staged by Frank A. Stites, who, after completing the stunt, found his plane on fire and, to avoid falling into the crowd, heroically crashed his plane against the back lot hills and was instantly killed. Out at the end of the ranch there were motion picture scenes being filmed, and there were amusing sideshows, and the big zoo, with its wild animals. Bands played, candy and soda booths did business and wild Arabs rode elephants down the road. The ball that evening was attended by 2,000 people and was held in the large inside studio, which was handsomely decorated with flags and flowers. “Daddy” Manley, the oldest motion picture actor at that time, 88 years old, and “Mother” Benson, led the grand march, which was reviewed by Laemmle and Bernstein. 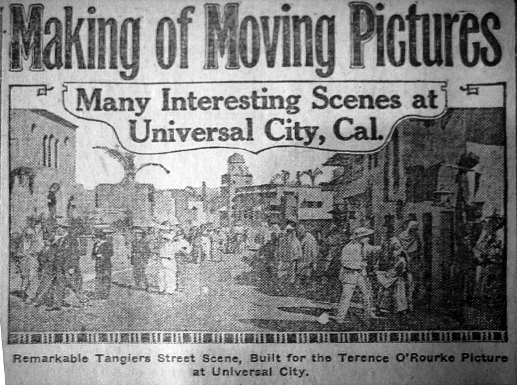 Among the celebrities who participated in filming scenes marking the opening of Universal City were J. Warren Kerrigan, Louise Lovely, Marie Walcamp, Grace Cunard, Francis Ford, King Baggot, Arthur Johnson, Harry Carey, Wallace Reid, Dorothy Davenport, Henrietta Crossman, Helen Ware, Priscilla Dean, Dorothy Phillips, Frank Keenan, Hobart Bosworth, Alice Howell, Julia Dean, Digby Bell, Lon Chaney, Jean Hersholt, William Stowell, Betty Compson and many bit players who later became stars. 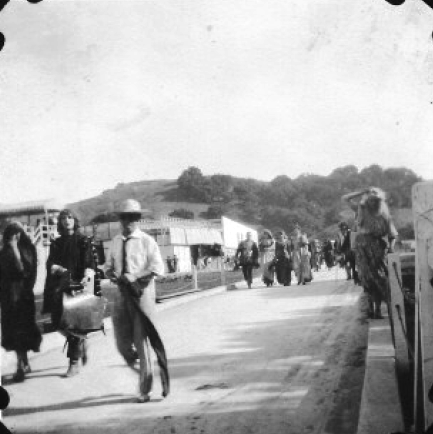 Visitors recalled that after the completion of the opening ceremonies at midnight on March 15, Laemmle and MacRae were stopped on their return to Hollywood when eight coyotes came out of the hills and blocked the narrow road before their car. Within fifteen years, more than 1,000 feature films and many short subjects, not to mention sixty serial thrillers were produced at Universal City. At one time, in 1917, there were forty-two directors working with an equal number of productions simultaneously, an all-time record for film production. In addition to almost fifty contract players, Universal City, in its first three years at this location, had sixty full-blooded Native Americans and the largest zoo in the West. The average film shipments from Universal City in 1915 and 1916 were 45,000 feet a week, a tremendous output, considering that features were one and two-reelers. INCARNATIONS: Gregory Paul Williams stands at Hollywood and Vine with a photo of the building he and other preservationists are trying to save. Originally the Coco Tree Cafe, it became Melody Lane, then Hody’s Restaurant. 1939 renovation eliminated much of the architect’s design, as well as the building’s historical significance, city council finds. The site was damaged in an April fire that remains unsolved. Preservationists hoping to save the facade of a Richard Neutra-designed building at Hollywood’s most famous corner have been told they are 70 years too late to stop demolition. Workers are removing the remains of the Basque nightclub, which was gutted about six months ago by a mysterious predawn fire at the intersection of Hollywood and Vine. The historic Laemmle Building on the northwest corner of Hollywood and Vine was demolished last Friday. Preservationists contend that the tearing down of the building, built by Universal Studios founder Carl Laemmle in 1932, is federally illegal. The building has been vacant since it was damaged in an unsolved arson fire in April. The intersection of Hollywood and Vine has been famous since the 1930s because many of Hollywood’s important radio stations were located nearby. “Brought to you from Hollywood and Vine” was a familiar opening to many early radio broadcasts. Carl Laemmle, paid the George W. Hoover (builder of the Hollywood Hotel) estate $350,000 for the property in 1925. At the time, that was the highest price paid for real estate in Hollywood (the lot sold for $15,000 in 1912). In 1928 Laemmle refused a $1,000,000 offer for the corner. Originally Laemmle planned to build a 900-seat theater and office building valued at $250,000. At some point in mid 1932 revisions were made to build a one story building with foundation specifications for additional stories to be added later (which never came about). Designed by famed architect, Richard Neutra in the International Style, construction began in September 1932, and was completed early the following year. At the time of the April fire, the building housed the Basque Nightclub and Restaurant, a popular celebrity hangout. Actress Lindsay Lohan celebrated her 21st birthday there and rap star Kanye West partied there earlier in April. Scenes from the movie Ocean’s Eleven were filmed there and the property had recently been sold as part of a renovation renaissance in Hollywood. While many historic buildings have been saved from destruction in Hollywood (and many more have been lost), the sudden demolition of the Laemmle Building questions the commitment of city officials on preservation issues in Los Angeles. Arguably the most famous intersection in the world, Hollywood and Vine sometimes disappoints tourists who search it out. Yesterday’s fire at the intersections northwest corner made me think about its history. The intersection first became famous in the 1930s because many of Hollywood’s important radio stations were located nearby. “Brought to you from Hollywood and Vine” was a familiar opening to many early radio broadcasts. Historic 1920s office buildings are located on three of its corners. On the northeast corner is the Equitable Building (1929), a Gothic Deco commercial building, designed by Aleck Curlett. The B. H. Dyas building (1927) on the southwest corner at one time housed The Broadway-Hollywood department store. It’s famous sign still stands on its roof. And on the southeast corner is the Taft Building (1923), by architects Walker & Eisen in the Renaissance Revival style. This building once housed offices for Charlie Chaplin, Will Rogers, Hedda Hopper, Photoplay magazine and the Academy of Motion Picture Arts and Sciences. On the northwest corner is the building devasted by yesterdays fire. At first glance it may not be mistaken for a Hollywood landmark, however, it was built in 1932-1933 by Universal founder, Carl Laemmle and bore his name (Laemmle Building) for many years. Designed by famed architect, Richard Neutra in the International Style, the building has been altered many times over the decades (beginning in 1940) and no longer retains any of its original features. Currently, the building housed the Basque Nightclub and Restaurant (6263 Hollywood Blvd. ), a popular celebrity hangout. Actress Lindsay Lohan recently celebrated her 21st birthday at Basque and rap star Kanye West partied there earlier in April. Scenes from the movie Ocean’s Eleven were filmed there and the property had recently been sold as part of a renovation renaissance in Hollywood. Sadly, the 75 year-old Laemmle Building’s future is unclear. It’s not known at this time if the building is a total loss and will be demolished or if it can be saved. Once it’s fate is known, it will be reported here.